In this section, we introduce the machine learning vocabulary that we use throughout scikit-learn and give a simple learning example. In general, a learning problem considers a set of n samples of data and then tries to predict properties of unknown data. If each sample is more than a single number and, for instance, a multi-dimensional entry (aka multivariate data), is it said to have several attributes or features. regression: if the desired output consists of one or more continuous variables, then the task is called regression. An example of a regression problem would be the prediction of the length of a salmon as a function of its age and weight. unsupervised learning, in which the training data consists of a set of input vectors x without any corresponding target values. The goal in such problems may be to discover groups of similar examples within the data, where it is called clustering, or to determine the distribution of data within the input space, known as density estimation, or to project the data from a high-dimensional space down to two or three dimensions for the purpose of visualization (Click here to go to the Scikit-Learn unsupervised learning page). Machine learning is about learning some properties of a data set and applying them to new data. This is why a common practice in machine learning to evaluate an algorithm is to split the data at hand into two sets, one that we call the training set on which we learn data properties and one that we call the testing set on which we test these properties. A dataset is a dictionary-like object that holds all the data and some metadata about the data. This data is stored in the .data member, which is a n_samples, n_features array. In the case of supervised problem, one or more response variables are stored in the .target member. More details on the different datasets can be found in the dedicated section. The simple example on this dataset illustrates how starting from the original problem one can shape the data for consumption in scikit-learn. 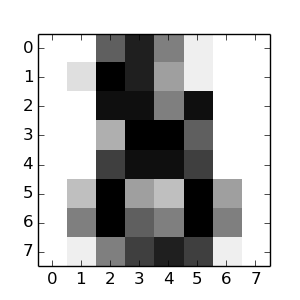 In the case of the digits dataset, the task is to predict, given an image, which digit it represents. We are given samples of each of the 10 possible classes (the digits zero through nine) on which we fit an estimator to be able to predict the classes to which unseen samples belong. In scikit-learn, an estimator for classification is a Python object that implements the methods fit(X, y) and predict(T). In this example we set the value of gamma manually. It is possible to automatically find good values for the parameters by using tools such as grid search and cross validation. As you can see, it is a challenging task: the images are of poor resolution. Do you agree with the classifier? A complete example of this classification problem is available as an example that you can run and study: Recognizing hand-written digits. joblib.dump returns a list of filenames. Each individual numpy array contained in the clf object is serialized as a separate file on the filesystem. All files are required in the same folder when reloading the model with joblib.load. Note that pickle has some security and maintainability issues. Please refer to section Model persistence for more detailed information about model persistence with scikit-learn.